Under a sunny Clearwater sky, the Philadelphia Phillies officially introduced Bryce Harper on Saturday afternoon at Spectrum Field. Harper, 26, agreed to a 13-year deal with the Phillies worth $330-million. Over the past four seasons (2015-18), Harper ranked second among all NL players in home runs (129), walks (430) and OPS (.952) and fourth in RBI (372) and runs (400). "I'm excited to be here, excited to get things started," Harper said. "I'm ready to get on the field." 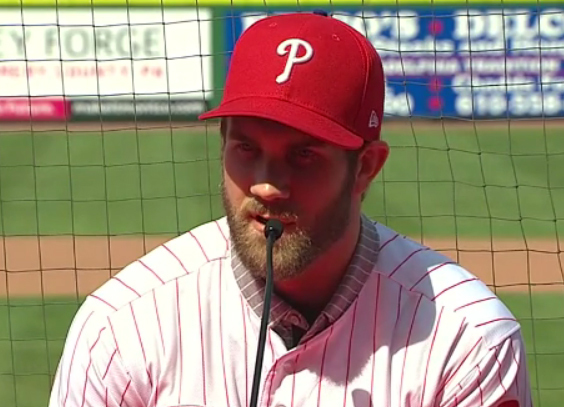 Harper spoke for nearly 30 minutes, answering multiple questions about the negotiation process, his interest in Philadelphia, and how he'll assimilate into the Philadelphia sports landscape. "This process has been a long one, but it’s been a lot of fun as well," said Harper. "It’s good to feel wanted by the Phillies organization and the fan base. I love my family very much, and Philly is going to be part of that family for a long time. I wanted to be somewhere for a long period of time, and I wanted to finish my career somewhere. "I can’t wait to get on the field and make Philly Nation proud." The contract, the richest in the history of American sports, does not include any opt-outs and potentially means Harper could be patrolling the outfield at Citizens Bank Park until 2032. "I wanted to be able to dig my roots somewhere," said Harper. “Through the ups and downs of the team and the organization. It’s going to be tough for our team to win every single year, I understand that. Even through the bumps and bruises, the goods and the bads, I want to be a part of that." The addition of Harper caps off an active offseason for the Phillies. With the additions of Jean Segura, Andrew McCutchen, J.T. Realmuto, and David Robertson, the club is expected to compete for a division title and potentially the National League pennant. Even with the additions, Harper has been around the sport long enough to know the talent on paper still has to perform to win championships. "This team is filled with perennial All-Stars who can be All-Stars every year,” said Harper. “You can go on and on about this team and about how good they can be. The East is a juggernaut. I’m not going to tell you that we’re going to win the World Series or the division this year, but good things take time to develop."